Johannes Berauer (composer); Thomas Gould (violin); Mike Walker (guitar); Gwilym Simcock ( piano); Martin Berauer (electric bass); Bernhard Schimpelsberger (drums, percussion). Johannes Berauer is an Austrian composer who incorporates many musical styles in his works, including classical avant-garde, jazz and world music. For this recording of Hourglass, a quintet has been assembled comprising some of the most accomplished and versatile musicians on the scene. 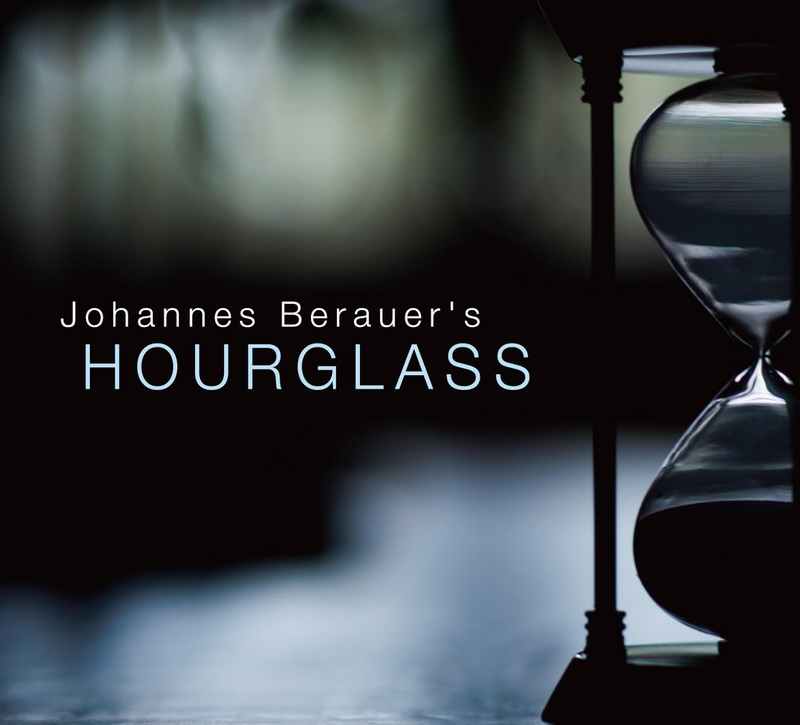 Hourglass is Berauer’s first composition for jazz combo, as he normally composes in more large-scale forms. The composition incorporates many influences including “Bach’s counterpoint, Messian’s sense for harmony, Indian rhythm language and M.C. Escher’s paradox views of reality”. Why Hourglass? “The Hourglass represents an island in time…, it allows us to enter into a space of no distraction. A personal space, a refuge in our otherwise overly hectic times. This space is the nourishing ground for the creative mind, for the musician and the listener alike”. In the Beginning kicks off at a brisk tempo with Gould’s soaring violin over a rhythmic percussive background. Sequential more improvisational solo passages from Simcock’s piano, Berauer’s bass and Walker’s guitar follow as the music takes a more relaxed course. One is reminded of a fast-flowing mountain stream, falling over a waterfall, before becoming a slower winding river in the flatlands below. East does what it says on the tin and takes us in an oriental direction, commencing with – Schimpelberger’s konnakol vocal percussion over tabla and subtle manual exploration under the lid of the piano. A full instrumental follows, with a tonality evocative of the mystic East. Tryptich is presented (unsurprisingly) in three parts: Secrets, Dreams and Phoenix. Keep Up maintains the up-tempo rhythmic flow present through the majority of this composition thus far and follows the pattern of sequential improvisational solo passages interspersed by full ensemble playing set in In the Beginning. Endless Time commences with a thoughtful solo passage on piano which sets the overall pace for this altogether more relaxed track. Time almost seems to stand still during the eight minutes or so of its duration. Nocturne is similarly laid back, as you would expect from the title. At nearly eleven minutes this is the longest track on the CD. The subtle melodic melange of the quintet brings a certain dream-like quality to this piece. Invention commences with another percussion solo, this time on pitched cowbells, then joined by bass, piano, violin – this is a chorale, distinctly after JS Bach, but in five time. Spiral winds up the CD with an atmospheric and uplifting piano and violin duet before the sand finally runs through. The Quintet are currently touring the album - I was privileged to be at the world premiere (a concept perhaps not celebrated enough in jazz) in Ambleside - and appear at Kings Place, September 5 and at Stapleford Granary, September 6. Two further dates in December are also listed at RNCM, Manchester (6th) and Attenborough Centre, Leicester (7th). Hugh, re your comment on jazz world premieres, at the recent Ushaw Jazz Festival there were at least eleven world premieres - maybe more! So I understand. I think it was Paul Edis who noted that (in contrast to the classical world) highlighting a world premiere performance in the jazz world was rare event.